If you’re not sure how to choose the best dog leash, then you’ve come to the right place! We are going to help you decide which dog leash would best suit your needs. Giving you a diverse list of wonderful leash products you’ll love. So, sit back, relax, and get to reading, because we are about to find you the perfect leash for your pup. Before we talk about how to choose the best dog leash, we should talk about the dog leash in general. The basic dog leash has a connection on one end that attaches to your dog’s collar or harness. And a loop at the other where you can comfortably hold it. Leashes are used by many pet owners for many different purposes. Leashes help to keep our pets safe from harm, and keep them close to us when they are outside of the security of our homes or fenced in backyards. And while leashes are as common as dogs themselves, not all leashes are created equally. Just as dogs are unique, so are dog leashes, and it’s important that you pick the right leash for your dog. For this reason, we suggest that whenever you are considering how to choose the best dog leash, you should also consider your dog’s activity level, reactiveness level, and size. Also, don’t forget about yourself. What are the types of activities you and your dog enjoy doing outside of the home together? Is Fido your jogging partner? Or perhaps he accompanies you on hikes? Or maybe the two of you enjoy a nice leisurely stroll through the neighborhoods at sunset? Whatever your purpose for needing a leash, we are here to help you find the right one. But why is picking the proper leash for your dog so important? Can’t you just go to the local store and look at any of the cheap dog leashes on sale? If you’re wondering how to choose the best dog leash, chances are you already have an idea of how important finding the right dog leash is. As we mentioned above, we leash our dogs for a number of reasons, and one of those reasons is for safety. The safety of our pets should always come first, which is exactly why picking the best leash for your dog and his size and activity level is so important. Reactive dogs will need leashes that are strong and can withstand the force of the pull. Smaller dogs may not need a thick dog leash, but they will need a harness, as they are more susceptible to tracheal collapse than larger dogs. So, are you ready to do some luxurious leash hunting? How to choose the best dog leash for a puppy? Getting a starter leash for your puppy is super important. Even though most puppies have no idea how to walk on a leash at first, leash training your pup and getting him used to being tethered to you will help to ease him into walking much quicker. Puppies who grow up without being leash-trained do not tolerate leashes very well and can even get anxiety when harnessed. That’s why we love this Pawtitas Reflective and Padded Puppy Leash. This durable leash comes in different sizes, a multitude of colors, and is double stitched for durability while also being made with reflective material. So, no matter what time you’re leash training your puppy, he’ll be safe and secure. Furthermore, regardless of how much your puppy tugs, chews, pulls, or plays, you can rest assured this leash is going to last. If you are looking for something less fancy and more straightforward for your puppy’s first starter leash, you may want to take a look at the PetSafe Nylon Puppy Leash. Lightweight, simple, and straightforward, the Petsafe Nylon leash is an excellent starter leash to get your pup used to walking. And perhaps our favorite puppy leash on this list is the Heavy Duty Adjustable Puppy Dog Safety Harness with Leash Lead Set. The harness allows for a safe and comfortable walk while leash training, and it’s adjustable, meaning it will grow with your pup. And for an extra-long dog leash for all your leash training needs, try the Hi Kiss Black Training Dog Leash for small, medium and large puppies or dogs. This long dog leash comes in an amazing range of lengths like 6 ft, 10 ft, 30 ft, 50 ft, 100 ft, and even 200 ft! If you have a small dog like a Yorkie or Chihuahua and are looking for a small dog leash, one of the most important things to remember is that smaller dogs are more susceptible to tracheal collapse than larger dogs. But how to choose the best dog leash for tiny and medium-sized pups? For safety and comfort, we recommend leash and harness sets for small dogs, like this Petetpet Harness and Leash Set for Small Dogs. The Petetpet’s design makes for a no choke, comfortable walk with you and your tiny pooch. It is also a no pull dog leash. We also love the QQPETS Dog Harness Leash Set for both small and medium breeds. It comes in a number of cute and cool designs to suit your pet’s unique personality while keeping him safe and sound on walks. Another favorite is the Smalllee_Lucky_Store Soft Mesh Nylon Vest and Harness Set for Small Dogs. Safe, comfortable, reliable, and adorable, this small dog leash and harness set will get your petit pooch where he needs to go with style and ease. Now, keep reading to learn how to choose the best dog leash for large dogs! Are you looking for the best dog leashes for walking your large pup? If you’ve got a gentle giant who loves to causally stroll, check out the 5 FT Strong Dog Leash for Large Dogs by BAAPET. It makes walking your large dog easy with durable, reflective material and a padded handle for your comfort as well. Another large dog leash, and one of the best retractable dog leash options, is the Heavy Duty Retractable Dog Leash by Hertzco. Great for dogs up to 110 pounds, this retractable dog leash lets Fido explore without making him feel constrained, all the while keeping you in control. And while we love these leashes for big dogs, let’s talk about reactive dogs and how to choose the best dog leash for them. Reactive dogs tend to pull and bark and jump, especially if they see other dogs or people during their walk. If this sounds like your dog, you may want to check out this strong dog leash by Leashboss Original. Built specifically for dogs that pull, this leash is equipped with two padded handles for if you need to get better control of your over-excited pup. And for the reactive dog who is a chewer and likes to try and walk himself, the Chew Proof Yobao Large Breed Leash is an excellent choice. At the end of this strong dog leash is a sturdy metal chain, discouraging chewing behaviors on walks. Are you worried your dog will break through traditional materials and are looking for something a little sturdier? Check out this metal dog leash by Berry Pet. Made with sturdy metal chain, this big dog leash is perfect for the medium to large dog in your life. We also like this short dog leash by Leash Boss. It’s great for dogs in training or reactive dogs, offering you the best control possible while giving comfort to both you and your pet. The Stunt Puppy Stunt Runner Hands-Free Dog Leash is a fabulous choice for joggers. Hooking around your waist for a hands-free design, this durable leash is made for the human and canine on the move. Its stretchy connector allows for movement without jostling one another or interrupting you or Fido’s run. It also comes in different sizes and several different colors. Another hands-free jogging leash is the Black Rhino Premium Hands-Free Leash. Perfect for jogging, hiking, or just plain old walking, this leash offers a two-in-one with included padded handles, which allows you to make it a standard leash at your leisure. Of course, when you are figuring out how to choose the best dog leash, you may not want to put aside looks. We understand, and that’s why we’ve compiled a list of some of our favorite designer dog leashes below! Who doesn’t love cute dog leashes? Looking for a leather dog leash that is not only durable but adorable? Check out this designer dog leash by Blueberry Pet. Made with genuine leather, this is one of many cool dog leashes around. It is also the best leather dog leash for those pet parents looking for comfort and style. Blueberry Pet also makes festive designer holiday dog leashes. Instead of trying to figure out how to choose the best dog leash, why not learn how to make a dog leash out of fabric? Making your dog a durable dog leash is easier than you may think, with tons of video tutorials on Youtube showing you how to get started. And while there are a number of dog leashes, dog leash clips, and dog leash clasp options available to buy, nothing says “you’re the peanut butter to my jelly” like giving your pup a homemade leash. Check out this video on how to make a leash for your large dog. And this video on how to make a leash for your small or medium sized dog. Finding the best dog leash means nothing if you have a dog who refuses to walk. 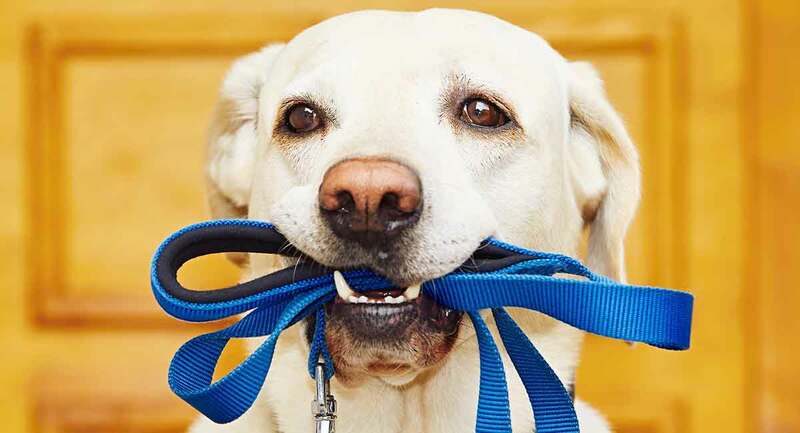 So, now that you’ve figured out how to choose the best dog leash, let’s quickly talk about putting that good dog leash to work. Training your dog to use his leash should begin in puppyhood. Always use treats and positive reinforcement when leash training to ensure your pup realizes that his leash is a good thing. Click here for more leash training tips, and to find a great harness to go along with your new leash, visit us here. So, did you find the best dog leash ever for you and your pup? Tell us below! Lynelle Johnson, DVM, SM, PhD. Tracheal Collapse. Veterinary Clinics: Small Animal Practice. Hiby et al. Dog Training Methods: Their Use, Effectiveness, and Interaction with Behaviour and Welfare. Animal Welfare 2004. Arhant et al. Behaviour of Smaller and Larger Dogs: Effects of Training Methods, Inconsistency of Owner Behaviour and Level of Engagement in Activities with the dog. Applied Animal Behaviour Science.